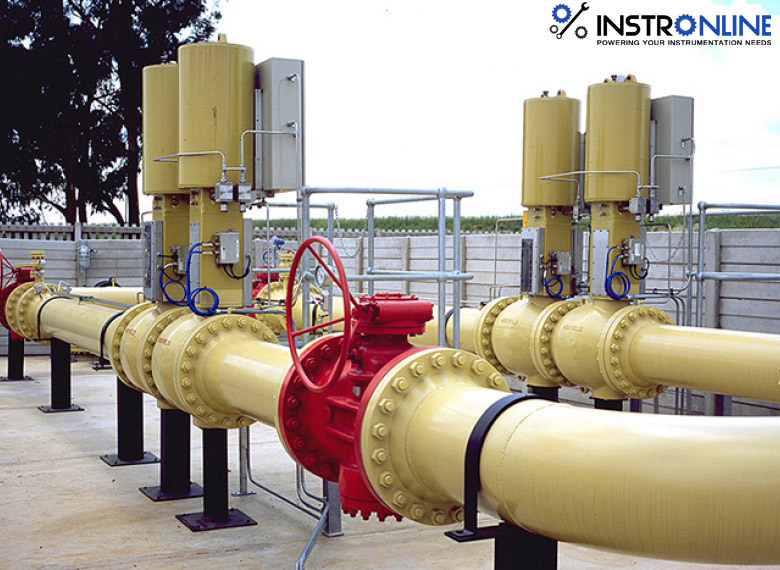 Hydraulic actuators use liquid pressure rather than instrument air pressure to apply force on the diaphragm to move the valve actuator and then to position valve stem. Nearly all hydraulic actuator designs use a piston rather than a diaphragm to convert fluid pressure into mechanical force. The high pressure rating of piston actuators lends itself well to typical hydraulic system pressures, and the lubricating nature of hydraulic oil helps to overcome the characteristic friction of piston-type actuators. Given the high pressure ratings of most hydraulic pistons, it is possible to generate tremendous actuating forces with a hydraulic actuator, even if the piston area is modest. For example, an hydraulic pressure of 2000 PSI applied to one side of a 3 inch diameter piston will generate a linear thrust exceeding 14000 pounds (7 tons)! In addition to the ability of hydraulic actuators to easily generate extremely large forces, they also exhibit very stable positioning owing to the non-compressibility of hydraulic oil. Unlike pneumatic actuators, where the actuating fluid (air) is “elastic,” the oil inside a hydraulic actuator cylinder does not yield appreciably under stress. If the passage of oil to and from a hydraulic cylinder is blocked by small valves, the actuator will become firmly “locked” into place. This is an important feature for certain valve-positioning applications where the actuator must firmly hold the valve position in one position. Some hydraulic actuators contain their own electrically-controlled pumps to provide the fluid power, so the valve is actually controlled by an electric signal. Other hydraulic actuators rely on a separate fluid power system (pump, reservoir, cooler, hand or solenoid valves, etc.) to provide hydraulic pressure on which to operate. Hydraulic pressure supply systems, however, tend to be more limited in physical span than pneumatic distribution systems due to the need for thick-walled tubing (to contain the high oil pressure), the need to purge the system of all gas bubbles, and the problem of maintaining a leak-free distribution network. It is usually not practical to build a hydraulic oil supply and distribution system large enough to cover the entirety of an industrial facility. Another disadvantage of hydraulic systems compared to pneumatic is lack of intrinsic power storage. Compressed air systems, by virtue of air’s compressibility (elasticity), naturally store energy in any pressurized volumes, and so provide a certain degree of “reserve” power in the event that the main compressor shut down. Hydraulic systems do not naturally exhibit this desirable trait. A hydraulic piston actuator attached to a large shut-off valve (used for on/off control rather than throttling) appears in the next photograph. Two hydraulic cylinders may be seen above the round valve body, mounted horizontally.